This is the first book for parents based on the highly successful Read Right[registered) program. According to the latest breakthroughs in cognitive theory and brain research, excellent reading ability doesn't involve a set of 'taught' skills. It's a complex process that must be 'figured out' by every reader. Scientifically documented as early as the 1960s, preschool-age children with a wide range of IQs are capable of figuring out the complex process for themselves. This stunning reality forms the basis of Dr. Dee Tadlock's innovative Read Right[registered] system. This remarkable system provides the basis for simple techniques to help parents guide young children into their own reading excellence.There are no drills or artificial exercises - just fun, easy activities designed to be integrated into everyday life. Based on nearly twenty-five years of research, the Read Right[registered] system is a proven alternative to outdated and incomplete phonics-based or whole-language methods. 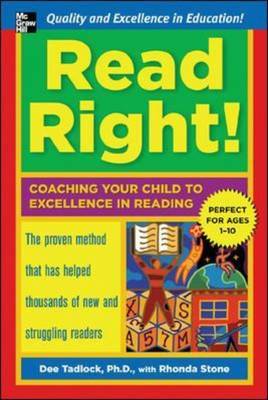 Most important, this interactive system can teach anyone, even adults, how to 'figure out' the process of reading. The Read Right[registered] system's three keys are: Excellence - reading that feels comfortable and sounds natural; Intent - applying 'mental force' until the brain achieves excellence; and The predictive strategy - using experimentation to figure out the complex process. This title includes recommended books for children and reference sources for parents.